Shopping on the Internet can be a real treat. You can browse items at any time of the day or night from the comfort of your own home. There's no travel time involved, and just think of the money you'll save on petrol. Whether the shops are located down the street or down under, you can wander among the goods to your heart's content. But therein lies the problem - once you've purchased your prized possession, how do you get it delivered to your door? And what extra charges might pop up in the process? If you buy items online from abroad, you need to know that VAT and customs duty will be payable, depending on the type and value of the products. Your best bet is to visit the appropriate government websites to determine exactly the charges for which you may be liable. In general, customs duty is due on goods with value greater than £7, with import VAT coming into play above £18. Different rules apply for goods shipped from countries with the EU. Plus, there are special rules for items classified as excise goods. These include alcohol and tobacco products. Although many Internet sellers are honest business people, you should be aware that some may deliberately attempt to circumvent customs and tax regulations. Websites may misdescribe items and/or under-declare their value in an attempt to evade legal customs charges. Regardless of their actions, you--as the consumer and importer--are responsible for the information provided to customs authorities. Not only are you required to pay any customs charges that are due, you can be held financially and criminally liable for false or misleading declarations. Therefore, it is in your best interest to make sure that all the customs paperwork for your order is in order. 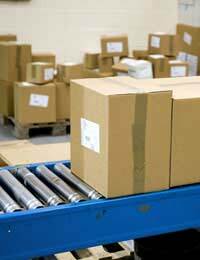 For most of the major online retailers, shipping processes and charges are transparent and straightforward. But in the case of some Internet sellers, shipping charges are viewed as an additional source of income. Sellers are required by law to fully disclose any additional costs associated with your purchase. But it's your responsibility to search out the total price for shipping and make decisions regarding the most economical and efficient method. When you purchase goods online, should you pay extra to insure those items in transit? Anything that you buy from a business seller is normally shipped at the seller's risk. If that is indeed the case, there would be no benefit for you as the consumer to purchase extra shipping insurance. However, if you buy something from a private seller in an online auction, the risk in transit may be yours to cover. The point is to never make assumptions about who will pay if your purchase is lost along the way. Confirm details with the seller before money changes hands. What happens if the goods you've ordered online don't show up at your door, arrived damaged, or come out of the box as something completely different from what you thought you were ordering? Let's take the last instance first. Your options in the case of receiving less-than-described goods differs somewhat depending on who the seller was. If you purchased goods from a business seller, the items must "conform to contract." This means that each item should be as described online, that the quality must be satisfactory, and that they should be fit for the purpose for which they were designed. On the other hand, when you purchase from a private individual, the goods are only required to be "as described." These requirements apply to both new and second-hand goods, although used goods will probably be judged less rigorously. An enjoyable Internet shopping experience requires some prior research on your part. However, the more online shopping you do, the easier it will get. You'll become quite the expert about customs duty, VAT, shipping methods and optional insurance. By the next holiday season, you may be able to buy all your gifts without ever leaving home. Unless, of course, you prefer the hustle and bustle of real world shopping. Hi, I give my customers the option to have free 2nd class delivery or pay £4.99 for next day after sending. The next day after sending option has higher compensation. If a customer chooses the free 2nd class for an order of over £65 (when free shipping is an option) rather than pay for higher compensation, and the parcel goes missing, do I have to refund the full amount or just the basic £20 or so from Royal Mail, because the customer chose to risk the option with less compensation? Would the customer also have to make the claim or do I? The Consumer Rights Act, says that for online orders, the retailer is responsible for the goods until the customer receives them. So if an item is lost or damaged it's your responsibility as a retailer to refund the customer (the full amount) and then you should pursue the issue yourself with the courier or postal company. Hi, I give my customers the option to have free 2nd class delivery or pay £4.99 for next day after sending.The next day after sending option has higher compensation.If a customer chooses the free 2nd class for an order of over £65 (when free shipping is an option) rather than pay for higher compensation, and the parcel goes missing, do I have to refund the full amount or just the basic £20 or so from Royal Mail, because the customer chose to risk the option with less compensation?Would the customer also have tomake the claim or do I?